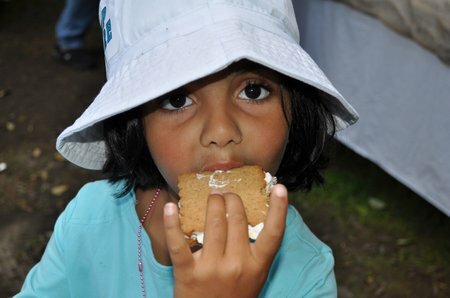 We had a wonderful time at Camp S’more on the weekend for my daughter Paige’s eighth birthday party. 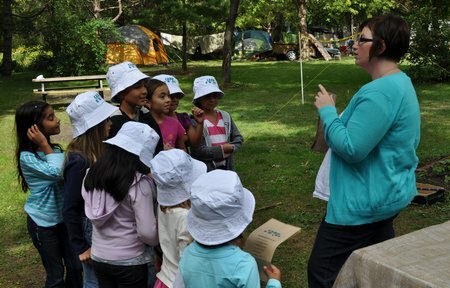 I wanted to do a few camping themed activities at the party for all the kids to enjoy. Here’s what I came up with. 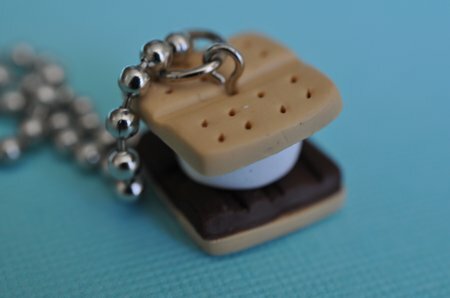 Since our camp name was Camp S’more, I wondered if we could do some kind of s’more themed craft, and I stumbled upon some cute s’mores made out of polymer clay on etsy. After a little more googling I found some great videos on YouTube, if you’re interested try here and here. 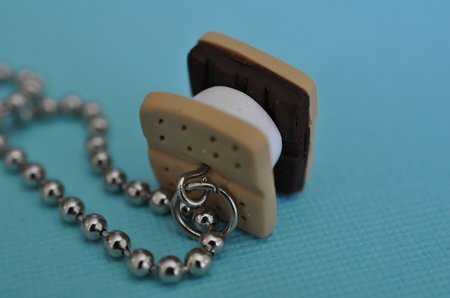 Paige isn’t really a jewellery girl, so we made ours into key rings, or back-pack clips, but they could easily be slipped onto a chain and worn as a necklace, like this one I made as an example and wore for the party. 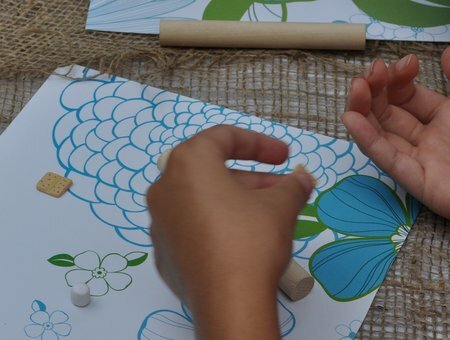 So, here’s how we made them, everyone was given a little placemat to work on. We started out forming the marshmallow, since I found on my own first attempts that if you start with the other components, the tan and brown clay leave residue on the mat, and the white clay picks it up as you try and make your marshmallow. After the marshmallow the kids used these little dowel rods as rolling pins, and rolled out their graham crackers, then cut them with the mini square cutter and used a tooth pick to make the characteristic line down the middle and small dots. For my first attempt at making them before the party, I used a small cardboard square as a template to help make the graham crackers the same size. I thought this might be a little tricky for our youngest guests. At Michaels I was pleased to discover that they make little cutters for polymer clay. The square one worked out great for the graham cracker and the chocolate square. The last part was the chocolate, rolled out and cut the same as the graham crackers and then we used a tooth pick to make lines for the chocolate bar sections. After all three pieces were done they stacked them together, I cut and added a little jewellery eyepin from Michaels and then I baked them in our toaster oven for 30 min. according to the package instructions. After they cooled I added a little jump ring, and the key chain hooks. When they were all finished, we attached them to the loot bags. I love how they turned out, and the kids loved them too. Inside their loot bags they also had a camping themed book. 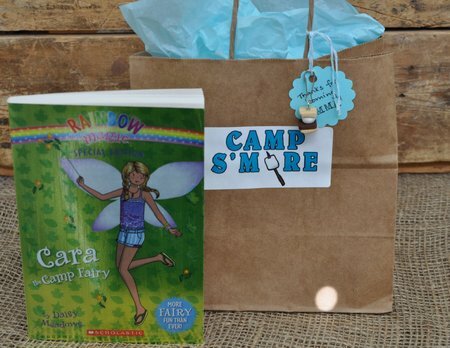 For the older girls we choose “Cara the Camping Fairy” -Paige and her friends LOVE the Rainbow Magic Fairy books. 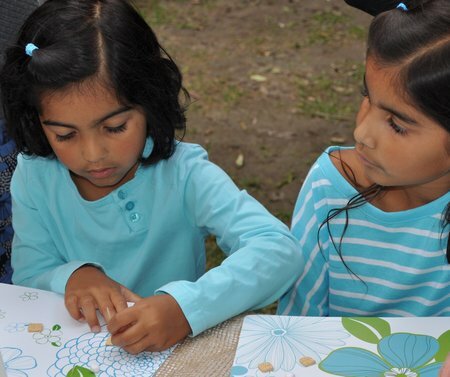 For some of our younger guests, we found “Curious George goes Camping” and “Caillou Goes Camping”. This is the first time I’ve used books in loot bags and think it’s a great idea. 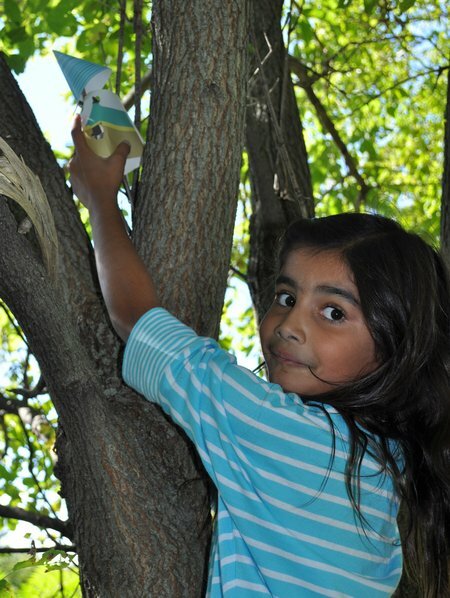 You know you’re giving something that the kids will actually use, and sometimes it’s nice to do one larger thing, instead of a bunch of little things. I’ve heard some reports that the kids really liked them too. 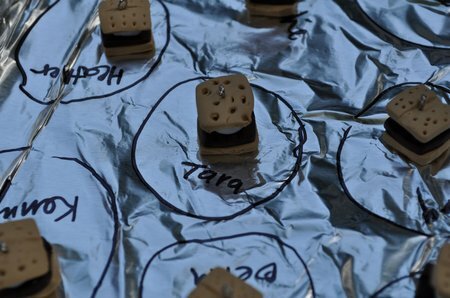 We did the s’more craft as soon as everyone arrived which worked out really well, since the kids were still fairly settled down and able to listen to the detailed instructions and it gave us time to bake and cool the clay. 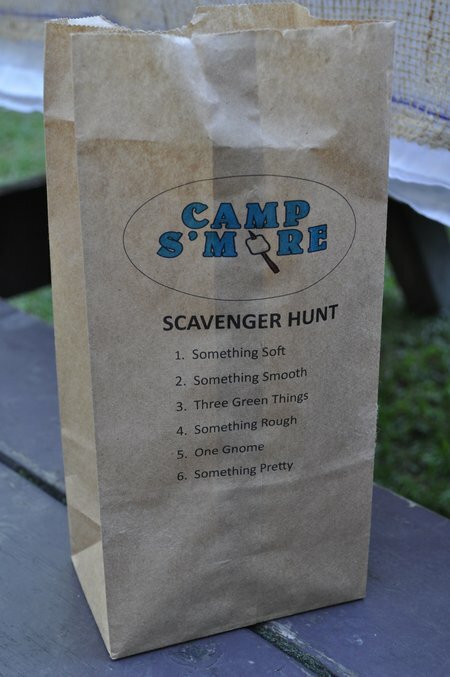 After the s’more craft we went on a little scavenger hunt. 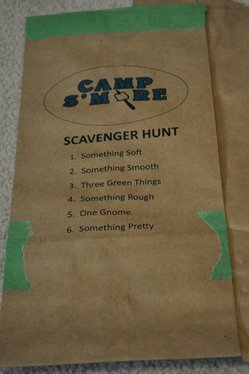 I made a scavenger hunt list (free printables coming tomorrow), and printed it right onto paper sandwich bags. I found out how to print on paper bags over at Oh Happy Day, here’s the scoop. You have to tape shut the bag and bottom flap so your printer doesn’t get jammed, and set your printer to print on thick paper. Feed them in one at a time, and once they’re printed remove the tape. I did find the tape a little too sticky, even though it was painters tape, and found reusing it over and over helped. 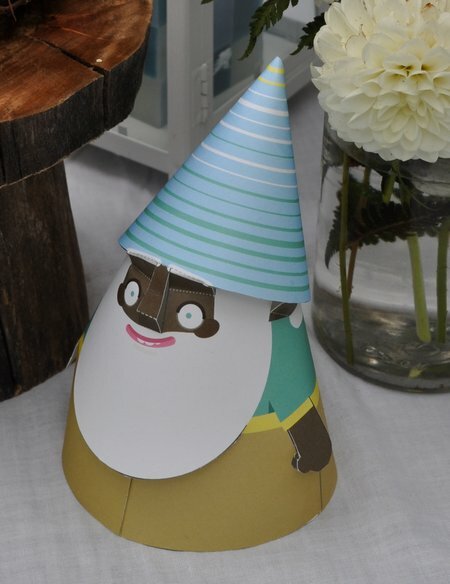 I used the gnome that fit our colour theme, named TJ, but there were tons to choose from. 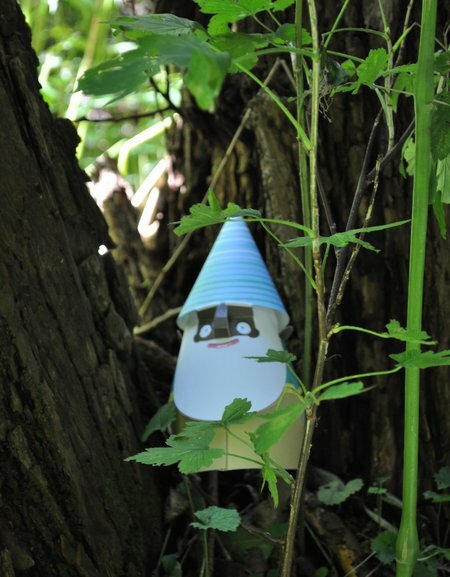 Grandma and Grandpa hid them in the woods while I was setting everything else up, and at scavenger hunt time the kids had a great time spotting and collecting them. This was a real hit, and so simple. 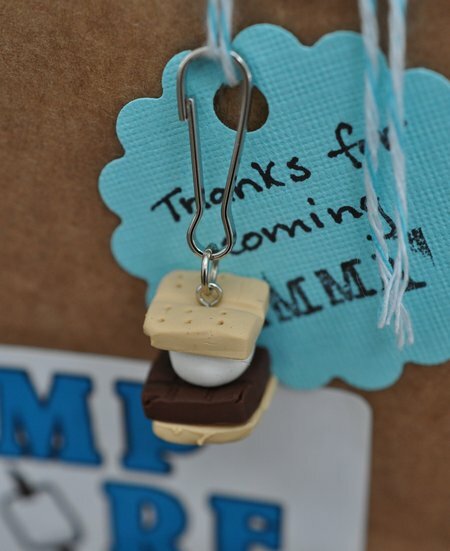 It was such a fun party, and the activities were really a hit, although it might have seemed a little crazy heading to the campsite with my toaster oven and really, really long extension cord -these are the crazy things mamas do for their kids, right? 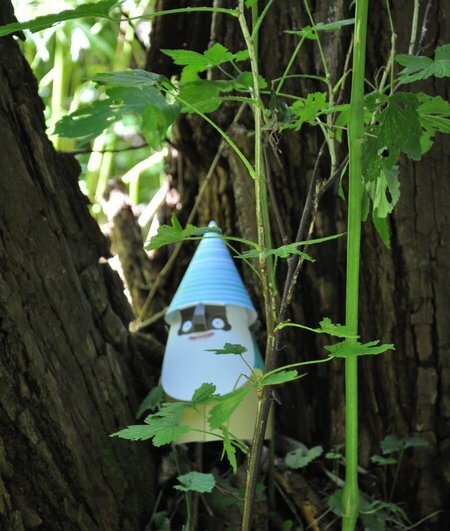 With s’more charms, and gnomes to find in the forest, life certainly is a party! This post is linked up at Craftberry Bush, Tatertots and Jello, Whipperberry, and Tidy Mom. You are seriously gifted- especially in the “party” planning area. 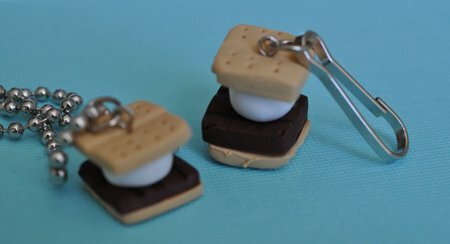 Those little smores are adorable!!! Absolutely fantastic job! What a very cute idea! I love it! I never thought about trying to feed a paper bag through my printer. What a good idea! You could probably avoid having to tape it if you feed the bottom of the bag into the printer first. You could flip your image upside down before printing it if you are using a graphics program. I’m not sure if you could do that with a word processing program, but you could maybe export your document as a jpeg file and then import it back in and turn that image upside down. Great idea, I’ll have to try it.